At the end of Chapter 1, Jane Austen sums up Mr Bennet’s character. He was an ‘odd mixture of quick parts, sarcastic humour, reserve and caprice…’ He enjoys winding people up. 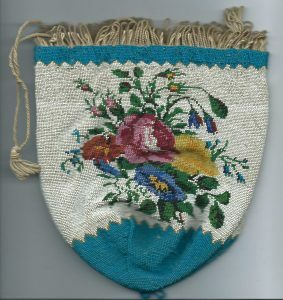 He allows his wife to think that he has no intention of paying that essential courtesy call on the newly-arrived Mr Bingley, a young, unmarried man with £5000 a year, without which Mrs Bennet will not be able to introduce her attractive daughters to him. He leaves her in ignorance until he’s extracted the maximum enjoyment from her agitation before telling her that he has paid the call. 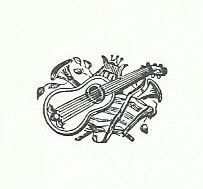 He picks up her hint and says, after Mary’s second song, ‘That will do extremely well, child. You have delighted us long enough. Let other young ladies have time to exhibit.’ Elizabeth must have heard the irony in his tone for she felt ‘sorry for (Mary), and sorry for her father’s speech.’ He could have done it more kindly. But Mr Bennet is not a kind man. When Mr Bingley suddenly leaves Netherfield without having made the expected offer to Jane – and it’s obvious to Elizabeth that Jane and Bingley are very much in love – Jane is deeply upset, and Elizabeth and Mrs Bennet are full of sympathy. It is callous, inappropriate, and he completely ignores Jane’s very real distress. The tone of Elizabeth’s response is interesting: ‘Thank you, sir, but a less agreeable man would satisfy me. We must not all expect Jane’s good fortune.’ On the surface, it sounds as though she is content to echo her father’s irony, but I wonder? She doesn’t call her father ‘Papa’ she calls him ‘sir’, as if distancing herself, a reaction further emphasized by her use of ‘We’ rather than ‘I’. The reader suspects that Elizabeth is hurt by her father’s reaction and that this conversation will not be passed on to Jane. Then there’s the question of the Bennet girls’ education. When Lady Catherine de Bourgh cross-questions Elizabeth about her and her sisters’ education, she discovers that they grew up without a governess; and that, although Elizabeth and Mary are both musical, they never went up to London to be properly taught. ‘My mother would have had no objection, but my father hates London,’ Elizabeth tells her. These are pertinent questions; and surely it is Mr Bennet’s duty as a parent to see that his daughters have a decent education, especially considering that they might have to work for a living if they don’t find husbands. We also learn from Lady Catherine that Mr Bennet’s income could well support proper music teachers. The Bennet girls can all read and write and are numerate. They would have been taught to sew (Lydia pulls apart a newly-bought hat prior to redesigning it) and they had obviously had dancing lessons – they are all good dancers. We know that Mary and Elizabeth were taught the piano by somebody (even if not a London professional) and they had singing lessons. 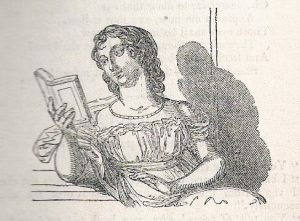 The sisters would have learnt a modicum of British History, even if only through Miss Mangnall’s Historical and Miscellaneous Questions for the Use of Young People (1798). They know various card games. Jane, at least, can ride. All the same, as Elizabeth says, ‘We were always encouraged to read, and had all the masters that were necessary. Those who chose to be idle certainly might.’ It is not very satisfactory. In my view, Mr Bennet should have seen to it that none of his daughters were allowed to be idle. And he certainly failed Mary. Mary isn’t pretty like her sisters; instead, she tries to be ‘accomplished’. But, although she is obviously intelligent, Mr Bennet doesn’t bother to teach her to think clearly. Her trite observations are allowed to stand and, doubtless, give her father some amusement, but that is, surely, not enough. He could have helped her – he is a thinking man – but he can’t be bothered. Furthermore, a man of breeding should treat his wife with respect – even if they have very little in common. To do otherwise sets a bad example to their children. 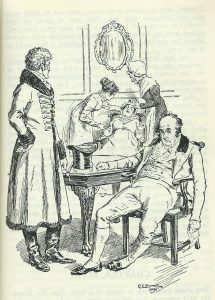 Sir Thomas Bertram in Mansfield Park, for example, always treats Lady Bertram courteously, even though she does very little apart from lying on her sofa and petting her dog, Pug. The Bertram children are expected to treat their mother with the respect which is her due. Mr Bennet allows himself to criticize his wife in front of his children. 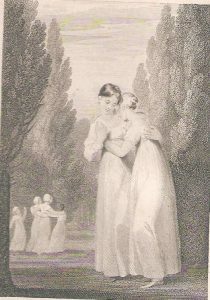 He says of Charlotte Lucas’s engagement to Mr Collins: ‘It gratified him … to discover that Charlotte Lucas, whom he had been used to think tolerably sensible, was as foolish as his wife and more foolish than his daughter!’ And he obviously enjoys Mrs Bennet’s distress about the Lucas-Collins match – and we sympathize – after all, the Netherfield estate is entailed and it is Mr Collins who will inherit it when Mr Bennet dies not Mrs Bennet and her daughters. They will be homeless. It is not Mr Bennet’s fault that he only has daughters, but it is his responsibility to see that his wife and children are properly provided for after his death. We are told, towards the end of the book, that he had ‘often wished that, instead of spending his whole income, he had laid by an annual sum, for the better provision of his children, and of his wife, if she should survive him.’ It was his duty to have done so, as he eventually recognizes. He listens, and he has an answer to her points which satisfies him, and he gives Lydia permission to go to Brighton. When push comes to shove, he always goes for the option which will cost him the least trouble. At the end of the book, Mr Bennet has married off three of his five daughters, so money will be less tight. He could, if he so chose, start saving for Kitty, Mary and his wife’s futures. But he doesn’t, ‘he naturally returned to all his former indolence.’ Perhaps he assumes (probably correctly) that his two rich sons-in-law will make sure that his wife and unmarried daughters will be comfortable, financially. It is not an admirable trait. 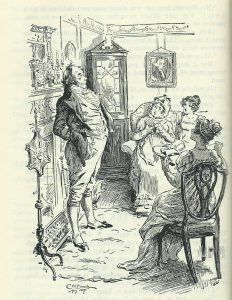 There are other fathers in Jane Austen’s novels whose characters may be worthy of censure: General Tilney’s bullying, for example, or Sir Walter Elliot’s snobbery and financial fecklessness, but it is Mr Bennet’s disengagement from his daughters’ upbringing which makes him the most blameworthy, in my opinion. Thank you. Anne. I’m glad you enjoyed it. I felt that too many readers blame Mrs Bennet and forget Mr Bennet’s sins of omission which, in my view, are pretty serious. What a good piece, Elizabeth; When I first came across the Bennets, I thought Mrs B was foolish and ridiculous with her harping on about the girls catching husbands; and I loved Mr Bennet’s sardonic wit. Now I look back and feel sorry for Mrs Bennet – she was foolish, but she had wit enough to realise how important it was for her daughters to have comfortable futures with decent husbands. 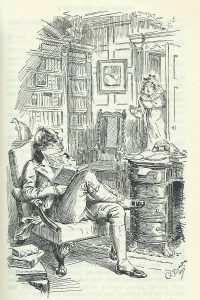 Mr Bennet must have known this too, but he seems to have had no sense of responsibility towards his family – he just hid away with his books, emerging now and then to make unkind remarks about his wife or younger daughters. 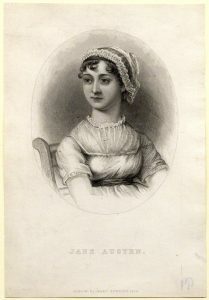 Jane Austen is so subtle – she allows him his clever remarks, but does not applaud them. Thank you for your kind words, Prem. While writing the post, various things came up which set me thinking. 1) Lady Catherine de Bourgh points out that Webb girls all have proper music lessons in London, in spite of their father having a smaller income than Mr Bennet’s. And 2) that, as Mrs Bennet tells Mr Collins, they can afford to pay for a good cook. It sounds to me as if Mr Bennet has money enough for his own pleasures (he’s a foodie) but he won’t bestir himself to ensure that his two musical daughters get good London teachers. He himself doesn’t like London – so it doesn’t happen. In the book, this is only hinted at but I bet readers at the time would have picked it up. It takes modern readers a bit longer.